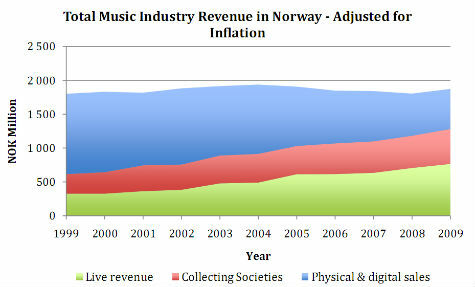 An extensive study into the effect of digitalization on the music industry in Norway has shed an interesting light on the position of artists today, compared to 1999. While the music industry often talks about artists being on the brink of bankruptcy due to illicit file-sharing, the study found that the number of artists as well as their average income has seen a major increase in the last decade. Every other month a new study addressing the link between music piracy and music revenues surfaces, but only a few really stand out. One of the most elaborate and complete studies conducted in recent times is the master thesis of Norwegian School of Management students Anders Sørbo and Richard Bjerkøe. In their thesis, the students take a detailed look at the different revenue streams of the music industry between 1999 and 2009. By doing so, they aim to answer the question of how the digitization of music – and the most common side-effect, piracy – have changed the economic position of the Norwegian music industry and Norwegian artists. The results are striking. After crunching the music industry’s numbers the researchers found that total industry revenue grew from 1.4 billion Norwegian kronor in 1999 to 1.9 billion in 2009. After adjusting this figure for inflation this comes down to a 4% increase in revenues for the music industry in this time period. Admittedly, this is not much of a growth, but things get more interesting when the research zooms in on artist revenue. In the same period when the overall revenues of the industry grew by only 4%, the revenue for artists alone more than doubled with an increase of 114%. After an inflation adjustment, artist revenue went up from 255 million in 1999 to 545 million kronor in 2009. Some of the growth can be attributed to the fact that the number of artists increased by 28% in the same time period. However, per artist the yearly income still saw a 66% increase from 80,000 to 133,000 kronor between 1999 and 2009. In conclusion, one could say that artists are far better off now than they were before the digitization of music started. Aside from looking at the reported revenue, the researchers also polled the artists themselves to find out what their income sources are. Here, it was found that record sales have never been a large part of the annual revenue of artists. In 1999, 70% of the artists made less than 9% of their total income from record sales, and in 2009 this went down to 50%. Live performances are the major source of income for most artists. 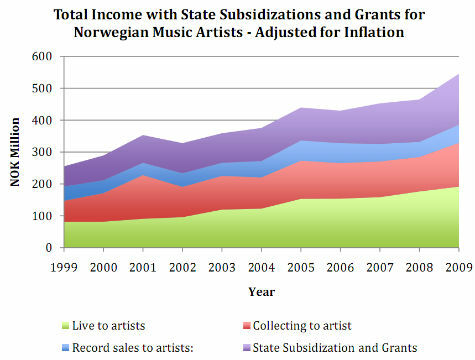 37% of Norwegian artists made more than 50% of their income from live performances in 2009, up from 25% in 1999. That said, it has to be noted that only a few artists make a full living off their music, as most have other jobs aside. In conclusion, the study refutes some of the most common misconceptions about the music industry in the digital age. Musicians are making more money than ever before. It is true that the revenues from record sales are dwindling, but that can be just as easily attributed to iTunes as The Pirate Bay. The bottom line is that the music industry as a whole is thriving. Record labels may report a dip in their income from record sales, but more money is going to artists at the same time. Is that really such a bad outcome? Well, that depends on who you’re listening to.